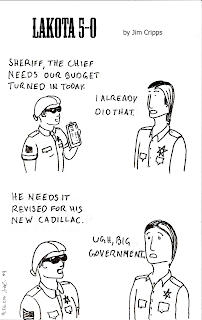 The daily comic strip about the Lakota Tribal Police force. Hilarity everyday! Today's Lakota 5-0, introduces a character, Eunice. This wasn't necessarily how I wanted her to look—prim, proper, able-bodied grandmother was whom I was aiming for. Funny how things turn. 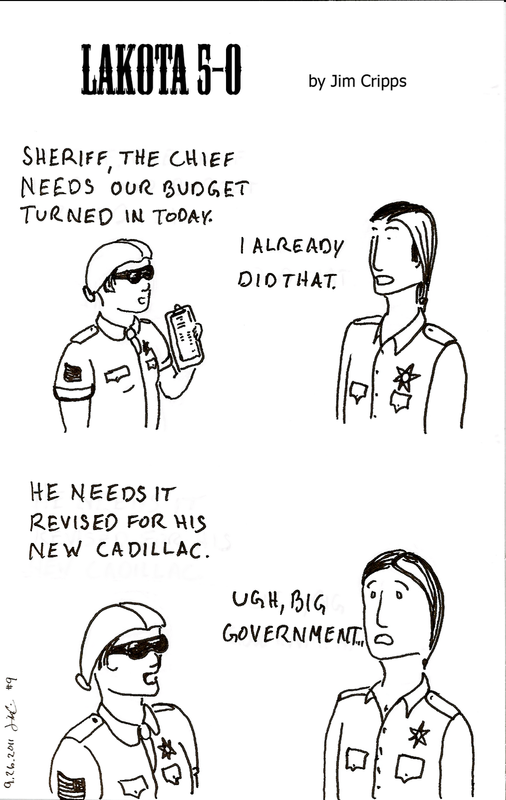 And yes, the Sheriff is changing for the worse. Go me, never can do the same thing twice as well. (EDIT) Forget to mention some more detail about this strip's idea. When I came up with the 'story', there was a lot of talk about the national budget, and how it needed to be balanced, and how money needed to be found, and the bickering over frivolous spending. And it's still a hot topic, unresolved. Lakota 5-0 creator, drawer, & writer. Lakota 5-0 copyright Jim M. Cripps. Awesome Inc. theme. Powered by Blogger.